Now that the summer heat is in full swing, Sirius Plumbing and Air Conditioning would like to provide some helpful water conservation tips. Below are some easy steps to take to help minimize your indoor water consumption. Washing dishes by hand can actually use much more water than using a dishwasher – especially if you have an ENERGY STAR qualified model which uses an average of 1/3 LESS water than non-qualified models. You could potentially save up to 5,000 gallons of water and 230 hours of your time each year. You can save up to 8 gallons of water a day simply by reusing your kitchen water. Don’t pour water down the drain when there may be another use for it. For instance, when you give your pet fresh water, reuse the old water for your houseplants. It can be safer for your health AND conserve water if you thaw frozen foods in the refrigerator overnight rather than using water to defrost them. Wasted food = wasted water – not only when you use your garbage disposal to dispose of food waste, but also in the amount of water it took to produce the food. Give back to the earth by composting your food waste. If you don’t have a use for compost in your yard, offer compostable materials to neighbors or community garden projects. On average, 2/3 of all the water our homes use indoors is in the bathroom – and nearly 30% of all water usage in the home is being used by toilets. Fixing a toilet leak is a great way to reduce household water use and boost water conservation. If your toilet has a leak, you could be wasting about 200 gallons of water every day. That would be like flushing your toilet more than 50 times for no reason. Bathroom sink faucets and accessories that use a maximum of 1.5 gallons per minute can reduce a sink’s water flow by 30 percent or more from the standard flow of 2.2 gallons per minute without sacrificing performance. There are more than 300 million people in the United States. If each person reduced his or her shower time by one minute, we could save a combined 165 billion gallons each year! Inspect pipes regularly for leaks or damage and fix any problems right away. Take care to protect ex posed pipes from being damaged or from freezing if you live in a colder climate. Know where your master shutoff valve is located. This could save water and prevent damage to your home in the event of pipes bursting, toilets or faucets leaking, or other similar instances. Also, make sure you replace worn supply lines and shutoff valves. Only use your washing machine when it’s full – and install a leak detector that will shut off the water supply if ruptured hoses, cracked fittings, or even internal failures occur. If you’re building a new house or remodeling, consider setting up a greywater system. These systems allow you to re-use the water from your sinks, laundry machine and dishwasher for watering house plants and flushing toilets. Alternatively, ask your plumber to re-route greywater to outdoor areas where it can water trees or bushes. The average washing machine uses about 41 gallons of water per load, and is the second largest water user in your home. High-efficiency washing machines use 35 to 50 percent less water, as well as 50 percent less energy per load. If you are in the market for a new clothes washer, consider buying a high-efficiency, water-saving ENERGY STAR labeled model to reduce water and energy use. Also, consider a model that offers cycle and load size adjustments, which are more water-and energy-efficient. ONE leaky faucet that drips at the rate of one drip per second can waste more than 3,000 gallons per year. A home with high-efficiency toilets could use that water to flush for six months! Being handy around the house doesn’t have to be difficult. Common types of leaks found in the home are worn toilet flappers, dripping faucets, and other leaking valves. These types of leaks are often easily correctable, in many cases requiring only a few tools and hardware that can pay for themselves in water savings. If you need help inspecting, repairing, or replacing fixtures or plumbing for your home, contact Sirius Plumbing & Air Conditioning at (972) 235-6600 for an appointment. Often times we receive calls that result from customers believing the following myths. Allow us, Sirius Plumbing and Air Conditioning to bust the myths and give some alternative techniques. This trick is commonly used to help freshen the smell of the disposal. What is little known is that the citric acid from the lemons can actually cause corrosion of your garbage disposal. Over time this can lead to expensive issues and even needing to replace the entire disposal. Instead of lemons, use ice cubes. They will rid your disposal of odor and polish and clean the inside of your disposal! This is not completely a myth. You definitely should run the water while you use your garbage disposal. The myth is that running the water allows you to put the entire contents of your refrigerator down the disposal. Additionally, there are foods that should never be put down the disposal, such as shrimp shells and crab legs. If you HAVE to put greasy food down the disposal the best option is to run very hot water while using the disposal. If you’re worried about the disposal smelling from the food and garbage day isn’t the next day, consider freezing the food in a trash bag until garbage day. To help the disposal, break down food before grinding and adhere to the 4:1 rule. This rule instructs 4 cups of water for every 1 cup of food put down the disposal. If everything washes down the sink or tub without issue everything is fine right? This isn’t necessarily true. Although your drains are running smoothly, objects such as hair can build up over time and cause future issues. To prevent expensive plumbing servicing, invest in a hair screen to protect your drain. This small preventative measure can save you a lot of money! If you’re in the Dallas/Fort Worth area and find an issue with your drains, call us at Sirius to help. A dripping faucet is to be expected. This is perhaps one of the most common myths. People think that a dripping or leaking faucet is normal and shouldn’t be a cause for concern. Contrarily, a dripping faucet can be an indicator of larger underlying issues. Especially here in the Dallas Fort Worth area, water is a precious thing. On average, a dripping faucet wastes about 500 gallons of water per year. That is equal to eleven bath tubs full of water! Even if you think your dripping faucet is insignificant, contact a plumber. Fix your dripping faucets quickly to save money and water. We hope that busting these few plumbing myths will help you. If you find yourself needing plumbing or air conditioning service, Sirius PAC is here to help. We service the Dallas/Forth Worth area with only the best technicians. Call us today at 972-235-6600 or for even faster service visit siriuspac.com. 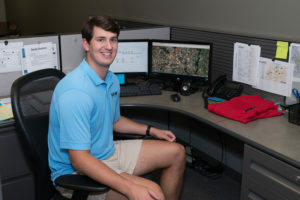 Sirius Plumbing and Air Conditioning hires a small group of interns each summer and pays them while they gain real world work experience. Davison “Davis” Champion feels fortunate to be one of them. Champion’s role at Sirius is to work in the Call center, coordinating parts delivery, function as a dispatcher, and be available for other key office responsibilities. He grew up in Crestview, Florida, with his older twin sister, currently an American Sign Language Major at Troy University in Troy, Alabama. They attended Crestview High School High School where he played two years on the varsity baseball team as a Pitcher, was a member of the National Honor Society, and a member of the Crestview High School Link Crew. He’s attending Auburn University, majoring in Finance, and is a member of the Financial Management Association Honor Society (Fall 2014′- Spring 2016′), Phi Theta Kappa Honor Society and Phi Sigma Kappa Fraternity. While many summer intern jobs don’t pay, Sirius knows it’s right to pay their interns—as they work and learn the business–to help them to afford and finish their college educations. Davis says his future plan is to return to Dallas to work, and hopes to get on with a commercial real estate firm in the Area. Davis Champion is much like his name–a champion at work and school, and a Sirius Intern the company is proud to employ. When you leave on vacation do you worry about your home’s safety? Sirius is here with a tip that can put you at ease when away from home. We recommend installing a flood stop on your water heater. What does a flood stop do you might ask? It does exactly what its name says, it stops floods. A flood stop is small box connected to your water heater. It is located on a wall near the water heater. There should be a flashing red light indicating that everything is “OK”. The flood stop works by sensing for water at the base of the water heater. If water is sensed, the flood stop will turn off the supply of water entering the water heater. This will stop continual flooding of the water heater and save you tens of thousands of dollars. If you want to invest in your home’s protection today, let us help you. Contact Sirius Plumbing and Air Conditioning at 972-235-6600 or for the fastest service, please fill out the service request form on our website. If your family is like ours, you spend a lot of time congregating in the kitchen. This means that it is important to having everything running properly. Faucets are a common kitchen problem. Two common kitchen faucet issues that, when simple, can be diagnosed and fixed by you are leaks and abnormal water flow. A popular faucet used today is a pull out spray. This is exactly as the name describes it, a head of a sink that can be pulled out to direct spray. If you have a leak on the faucet of a pull out spray, there a few steps you can take to fix the issue. First, you will need to turn the water off. This can be done by turning the “stops” found under the sink until water flow is stopped. Modern stops normally require a quarter turn, but if you have an older model you might have to turn for a while until the water shuts off. Now that the water is off, you can take the spray piece apart. This is a main source of leaking because when the pull out spray is used, the spray head can become loose. This is easily fixed by removing the spray head and reattaching it to ensure it is screwed on tightly. This can be done by hand, no tools required. Finally, turn on the water to check that the leak has been fixed. If the faucet it still leaking, it is time to call a plumber to find the issue. Another issue is abnormal water flow. At the connection between the hose and the sprayer head, there is a screen that can collect debris. If there is debris behind this screen, you will need to call a plumber. If debris is on the detached head piece, you can clean this out yourself in another sink. After debris is cleared, the sprayer head can be hand tightened back on to the hose. To keep your kitchen faucet working properly, we recommend that you check your faucet every month. If you experience any issues other than those we have discussed, you will need to contact a plumber. Here at Sirius Plumbing and Air Conditioning we are prepared to handle any issues, we have seen it all! Contact us at 972.235.6600 or for the fastest service, please fill out the service request form on our website.